We may regard Life as an expression of God and so form our opinions based on it, but it is only when we go beyond our mental constructions, however brilliant they may appear to us, that we may be able to enter into a viewpoint of a higher Consciousness already at work here in the terrestrial. It is rather the inlook than the outlook which matters, and the outward is only a circumstance or devising of the inner alchemy of the immanent Divine, who is also the Master of the universe and of whom we are figures and self-effectuating forces in the terrestrial consciousness. While Life may have emerged out of a secret Nescience, from an all-negating Darkness, the very fact of its emergence and its ability to thrill evolutionary forms with a wondrous movement of the Divine here presupposes the presence of an immanent Spirit even in the very Nescience and in the foreboding darkness which proceeded. Christian mythology, if there is anything at all, does not take into account the presence of this great Nescience but rather validates, mistakenly though, the darkness out of which God supposedly created the world and the living forms. Such puerile notions may seem appealing to the surface intelligence of man and excite or even inspire a moral servitude to those notions in him, but they will not carry him far into the realms of a greater knowledge and illumine his human intelligence so that he may see the higher truth and the larger picture which it presents. Science seems to have approved the notions of western theology by admitting them into its half-enlightened mind and trying to prove their validity by dubious semantics and surface experiments; neither it has the power to venture into the Unknowable or at least into a higher term of unmental intelligence from which a larger and a more all-embracing viewpoint is possible, something essentially and by nature free from mental errors and intervention. It is out of this higher sense of understanding that we have to approach the idea of a supreme Force as an all-Destroyer in the great dispensation of Nature and her evolution. The advent of Sri Krishna has enabled for the aspiring humanity the progressive curve of the Spirit free largely from the compulsions of lower nature, and he brought with his descent into the physical a certain Siddhi or power of self-conquest of the lower nature, a progressive upliftment of the lower into the higher, a living sense of the profounder infinities of the higher divine Spirit, a more secure foundation for the future figures and manifestations of the divine Spirit and a perception of a global oneness of consciousness at the lower mental levels, which looks upon everything with a sense of inherent unity and affirms through constant self-experience the oneness of creation with the all-Creator. This is not a mere figure of speech but statement of an innate, living experience in the heart and mind of the seeker, and since it is a realisation at the level of the higher mental planes, its manifestation here in the physical is guided by a centre of divine Consciousness, presiding over the evolution and leading it towards a greater delight of existence. It is a global Centre to which all other centres move irresistibly, it is a Consciousness from which all other consciousnesses derive and formulate into shape and substance in evolution. It is both an individual and a universal determinate, the source of all our seeking and aspiration, the secret call and its response. The advent of Sri Krishna in the individual marks the first foundation of a Superevolution in the terrestrial, for the individual is the first principle of a conscious evolution towards the supreme Nature of God. The process and method of evolution moves from self-negating impossibilities into utterly supreme possibilities; each stage of Nature’s upward curve is marked by external upheavals and inevitable destruction, the desideratum of the Mahakali force and her fierce will in the alchemy of Nature’s processes is the most natural outcome of a higher response to an equally fierce resistance in the terrestrial Matter. There is also a process and method of the higher divine Force, acting on the play of forces and throwing itself from its supreme heights into the terrestrial field of action for the realisation and manifestation of its higher potentialities in the lower human equations. But it cannot be done without amputating part of the incurable and recalcitrant part of the lower nature, for sometimes destruction in the right measure is a means to create newer and more durable forms of evolutionary Nature, something supple, plastic and less rigid in their constitutionalities. It is a process of mitigating the less favourable circumstances for the evolutionary soul or even for the whole of humanity by destroying the incurable symptoms, maladies, perversions and cruelties of lower human nature, and in the great process the descent of the higher Godhead into the earth-nature becomes both an imperative and an inevitable outcome. The law of destruction is not a mindless gorging of a hungry, destructive Spirit intent on reversing the world into a bloodied field of carnage and massacre, for it might seem a contradiction to believe in an all-benevolent Power out of which arose the carnage of Kurukshetra and the felling of numerous men, but if we look closely into the intent of the Godhead, the purpose for which he has brought about the great destruction, we might understand that this was done to preserve the evolving good as well as emerging synthesis of a collective humanity free from the self-destructive ego-impulse. 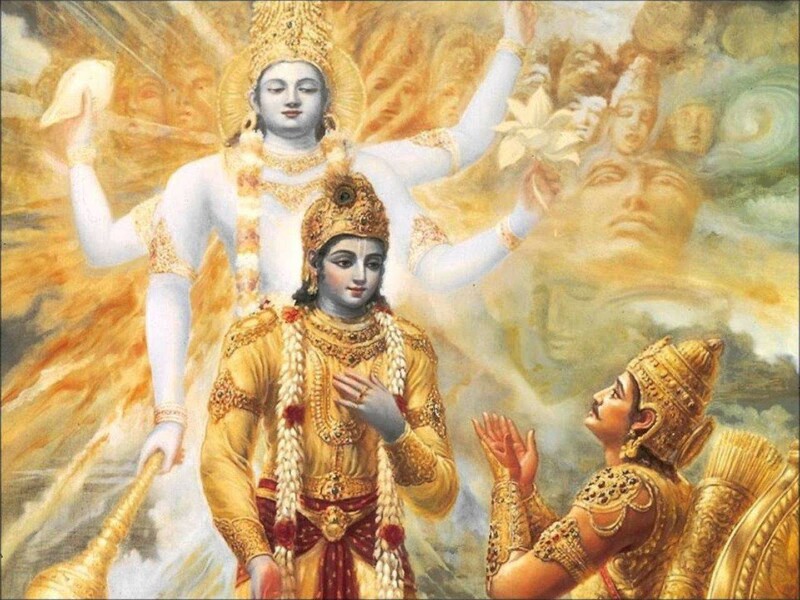 Arjuna was a symbol of an aspiring humanity fallen on its knees in utter weakness of self, and his self-conquest is also a symbol and a hope for the aspiring humanity to rise into the higher Spirit in utter spiritual self-conquest. There is a Light which governs the collective will of mankind leading it towards higher realms of self-knowledge beyond all strife and struggle; it is the Light of a universal Godhead who also in His higher infinities is the supracosmic Deity, the supreme and transcendent divine Person from whose creative Gnosis the whole descending stair has come into existence and out of whose immanence here in the terrestrial and in the indecipherable matrix of Inconscience the possibility as well as the inevitability of the conscious ascent of the soul into the nature of a higher divine Spirit. To govern the will of humanity is not easy, for the evolving humanity is complex and myriad in its hidden potentialities, and therefore, it is not possible to constrict its growth by the measure of science or religion, by the prodigal devices of human reason and critical judgement, by psychology or by the large measuring instruments of puerile human inventions. It is only by transcending humanity that it can well be understood and helped to grow towards the godward impulses. As humanity evolves into a collective Supermanhood, it breaks the shackles of science and reason, and soars into a higher dominant principle of an integral Spirit and its inherent spiritual unity. Also, the growth of humanity as well as the growth of the individual is the growth of the immanent Spirit here, and this Spirit in its inherent nature is both universal and transcendent and therefore integral in its constitutionality. It unconstrained by Time and unaffected by Causality. Without the immanent Divine, no evolution is possible. He is the ingrained principle and foundation of the evolving soul, the complex super-structure of humanity and its myriad becomings, the impelling energy behind Nature’s genius and her measureless workings, the fiat of her progressive curve towards the Divine Gnosis. A knowledge of the highest Truth and its dynamics in the progressive consciousness of humanity reveals itself in the integrality of a progressive descent of the Godhead into it, the highest meeting at the lower rung of the evolutionary ladder the cortex of a collective mind in its half-hearted and laborious ascent towards some collective principle of a mental afflatus, but it is more of a luminous imperfection, or if it is too harsh a definition, at least a half-perfection of the mental being standing on its self-saturated summit, the luminous froth of an incomplete knowledge and light in their dazzling infinity. If a spiritual self-saturation of the mental being alone is our goal, we have no further to go or bother ourselves with the descent of the Gnostic Spirit into the terrestrial, but without transforming the mental being and its higher ranges of consciousness, a completer perfection of the Spirit here is impossible. The descent of the higher into the lower always creates a horrible friction and a formidable resistance in the terrestrial, and in the mind and vital a revolt and a defiance to the higher forces of transformation. Even if humanity as a whole ascends into a dominant principle of the spiritual Mind, it is here in the earth its wonderful and august powers will be subsumed by the terrestrial resistance in the Inconscient, leaving the lower portion of humanity ignorant and letting it pass through the great Pralaya (dissolution). The descent of the Godhead into humanity and the terrestrial conditions, therefore, cannot be the descent of a higher individual power, but a still higher collective determination of the Gnostic Spirit, the One and the Many in the body of its own ineffable self-manifestation and infallible workings here in the earth-consciousness. It destroys all that is typal and adamantly recalcitrant, while it quickens the pace of evolution towards a higher term of the Spirit. Therefore, in the act of destruction lies constructive impulse of the evolving Spirit, the forward impulse of Nature in her brilliant march towards the infinite summits of an ever-ascending Supernature even in the last frontiers of Matter. Humanity is a collective disguise of an integral Godhead, and each individual ascent into the nature of the divine Godhead is one instance of the many numerous instances of a conscious ascent into His higher Nature, and His descent into humanity and terrestrial nature, though complete and integral in nature, must assume the individual points at first, leading to a larger persona and still to a larger group or set of groups and even larger communities. It is from these innate evolutionary developments and inner formations arise the character of a nation as its standing symbol of a great spiritual tradition. A sense of human collectivity based on an integral realisation of the Spirit in Matter must form the foundation of a progressive society or nation, and all her aspirations for a greater, collective self-development mark her character as the leader of nations and spiritual illuminator. Men, societies and nations are expressions of the one Spirit in its many-sided manifestation as the secret principle of evolution, the spontaneous impetus and fiat of Nature in her quest after divine perfection of the whole earth-consciousness. Sometimes, destruction or even a severe disruption and impairment might suit her methods to augment the evolutionary curve, and she always seeks from the divine Paramour above the necessary support and power of execution to carry out the intricate details of her evolutionary marvel, and in this pursuit of hers she destroys freely her old and imperfect forms and moulds in as much as she constructs newer and more perfect ones and lets the immanent Spirit here as much as its counterpart from above to perfect them by their native light of transformation and lead the earth and humanity to a perfect bliss and knowledge of existence here in the physical as much in the higher ranges of the spiritual Mind.